Hatters midfielder Andrew Shinnie is expecting to get further minutes this evening when Town head to AFC Wimbledon in the Checkatrade Trophy. The on-loan Birmingham City player had missed Luton’s last seven games with an ankle injury until he was back on the bench against Coventry on Saturday, coming on for the final 16 minutes in place of Harry Cornick. I’ll be playing there, hopefully get however long I can as I need to play there. 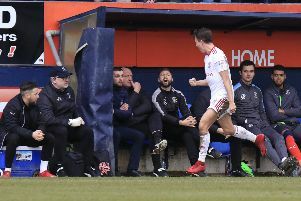 With boss Nathan Jones expected to make wholesale changes once more for the trip to the Dons, Shinnie wants to be on the teamsheet again, saying: “I’ll be playing there, I’ll hopefully get however long I can as I need to play there. “I’ll look forward to it and to get some more minutes as that’s how you get back in the zone and get your sharpness back. Team-mate Scott Cuthbert, who is unlikely to be called upon for the tie, hopes those who do play will take their opportunities too. He added: “It gives a chance for the lads who have maybe not played a lot of games to stake their claim to get in this team. “They’d have been a bit frustrated, we’ve kept the same team for the five games I think, so they’ll be wanting to put in a performance.